That's the way the apple crumbles, originally uploaded by electrolyte2006. I had an unexpected present on my doorstep on Sunday night. Once I got back from my sunset shoot I found a bag of apples waiting for me. Turned out they were from my lovely neighbours. They have a couple of apple trees in their garden and a few weeks ago while having a natter over the fence, as you do, I remarked how nice they looked. They said that they weren't great cooks and usually gave away their crop to the in-laws and get apple pies in return. Well, I decided that one good turn and all that meant I should cook a big batch of apple and blackberry crumble, keep some for myself and give a large dish-full to my neighbours. 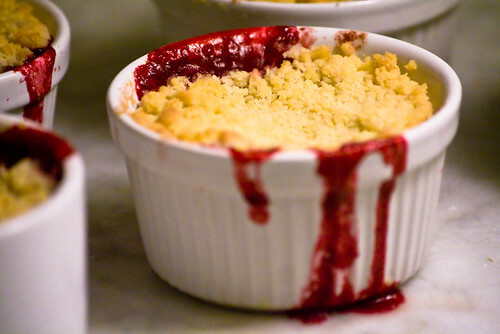 I also made a dish of crumble for my ex-in-laws as I knew they would appreciate some pudding! I now have a freezer full of crumble ramekins to join the home-made ready meals - I'll enjoy eating them over the next few weeks. The recipe for the crumble can be found on my flickr site here if you have as generous neighbours as I do.